"I recently went on a vacation and took a lot of pictures on my iPhone. I went to backup the photos on iCloud but suddenly my iPhone froze and all the pictures are now gone. How to recover them now? " "Please, I am desperate to know how to recover deleted photos from iPhone. I have my family pictures that are very precious to me, so please kindly show me how to recover my photos. " "Is it possible to recover photos after I reset my iPhone? Please do enlighten me." Recovering deleted photos from iPhone has been a hot topic all the times on Internet. It is certainly one of the most difficult tasks but it is possible. 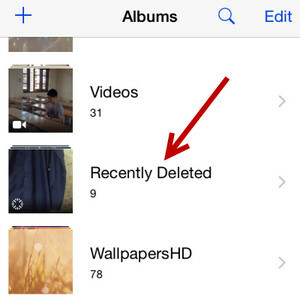 If you have accidentally deleted the photos from your iPhone like the above users then in this tutorial, you will learn 3 simple ways to get back those photos in a few clicks. Note: The following tutorial is also applicable to iPad and iPod. If the iPhone was powered by iOS 8 or later, then you are in great luck because iPhone saves the deleted photos for 30 days before they are gone permanently. Nonetheless, they doesn't really appear with the albums like regular photos but they are actually saved on another folder that could be found by following these steps. Step 1: Unlock iPhone if there is a passcode and open the Photos app. Step 2: Tap on albums and choose "Recently Deleted". Step 3: Open the folder and here you will find all the deleted photos that you recently erased. Choose all the photos that you want to restore and tap on "Recover" to save them back on your iPhone again. Step 4: On the other hand, if you wish to recover all photos then tap on "Select" and every single items will be automatically selected then tap on "Recover All" to restore them on your phone again. If the photos were deleted after 30 days, then there is no way to get them back with this method. Please keep reading and choose Methdo 2 or 3 instead. The easiest and safest way to recover deleted photos is using data recovery tool. Currently, the best iOS data recovery software available on the market is Androidphonesoft iPhone Data Recovery. It is a life-saving and valuable program that can retrieve all kinds of deleted files on iPhone, including photos, messages, call history, videos, audios, documents, WhatsApp and so on. It is especially designed to recover data from all iOS devices such as iPhone, iPod and iPad. 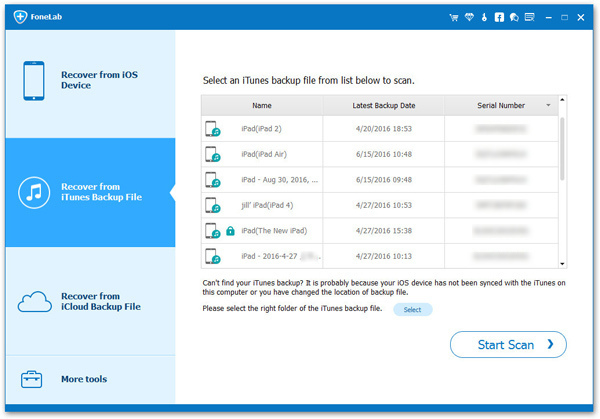 Another useful feature of this program is that it can extract items from iCloud and iTunes backup as well. It has a very attractive and clean user interface so that even computer beginners can operate this program without problem. It can recover deleted photos from various situations. Install the program on your Windows or Mac computer and gently open the program after finishing the installation progress. Connect your iPhone to PC with the USB cable and wait for the device to be recognized by the program. 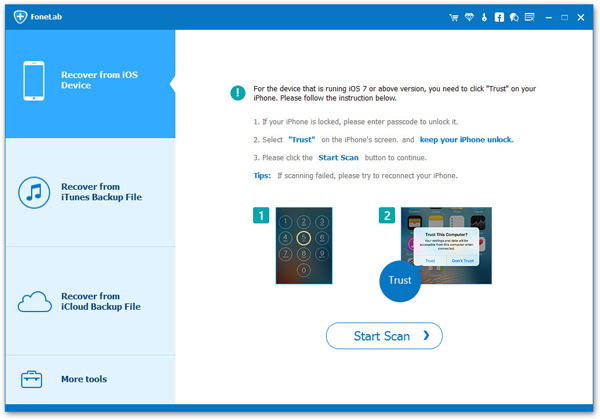 During this step, you need to type 'Trust' on iPhone to proceed to the next step. iPhone Data Recovery offers 3 options for different situations. For this part, we will choose "Recover from iOS Device". Hit the "Start Scan" button and wait for the program to thoroughly scan all deleted photos on that iPhone. Once the scanning process is successfully finished, you will be able to preview each deleted picture. Finally click on "Recover" button to save them on your PC. After that, you can transfer the photos to iPhone via iTunes or other services. Easy and fast. No programming talent needed. No computer skill needed. Simple and elegant program to recover data from iPhones. In addition to the above method, you can use iPhone Data Recovery to restore pictures from iCloud and iTunes backup file as well. It has an in-built feature where you will be able to login to your iCloud and iTunes account and retrieve all the data from them. No need to buy any additional software because Fonelab can perform all these tasks within itself. 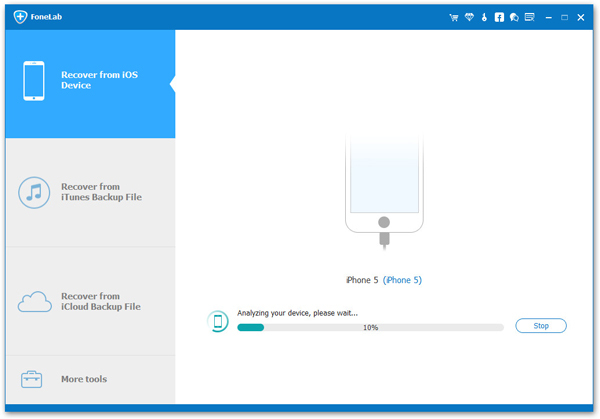 Open iPhone Data Recovery tool again and this time choose "Recover from iTunes Backup file". A few seconds later, all iTunes backup files on that computer will be loaded automatically. Please choose one from the list and click "Start Scan" button. 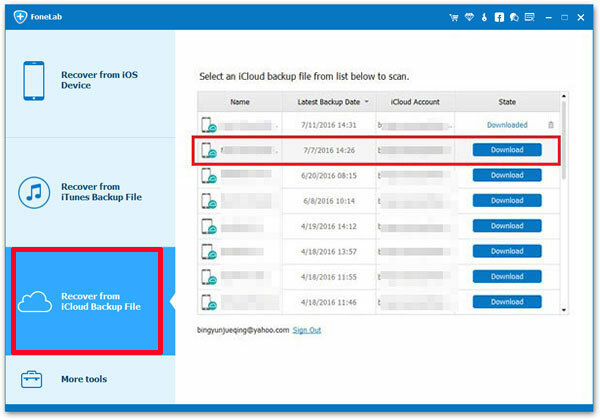 When the scanning is done, you can preview all the files from the backup file. Kindly browser the folder and find out the deleted photos. Once it is completed, please save them on computer by clicking "Recover" button. 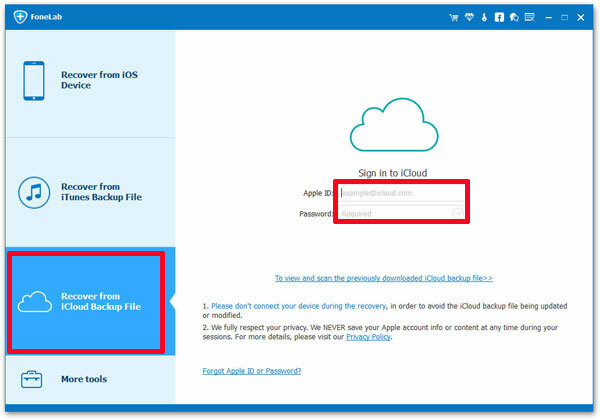 If you backed up iPhone with iCloud, then open the program and select "Recover from iCloud Backup File". At this time, you need to type Apple ID and password to authorize the action. After sign-in, you will get a list of iCloud files from the main screen. Just select one file and downlaod it to the computer. When the downloading is finished, the program will automatically extract all items from the file so you can find the deleted or missing photos. Accidentally data deletion can be very upsetting and disappointing especially if the pictures were from a trip or family gatherings. 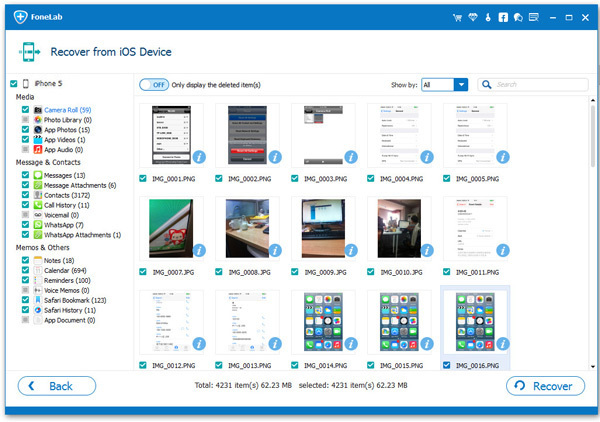 Thanks to Androidphonesoft iPhone Data Recovery tool, you can finally recover all the deleted photos with easement. Gone are those days when recovering was impossible. With iPhone Data Recovery, you can recover over 19+ data types pictures, videos, messages, contacts, WhatsApp, etc. and it is absolutely free to try. So, quickly go ahead and get a copy of your data recovery tool TODAY!